The stretch of North 90th Street bound by Wallingford and Aurora Avenue was a dirt road when Dave Kunkle’s family moved here in 1951. Almost everything around it has changed since, except the little pond his neighbor Chuck Pilling dug out in the 1920s as a 12-year-old boy. 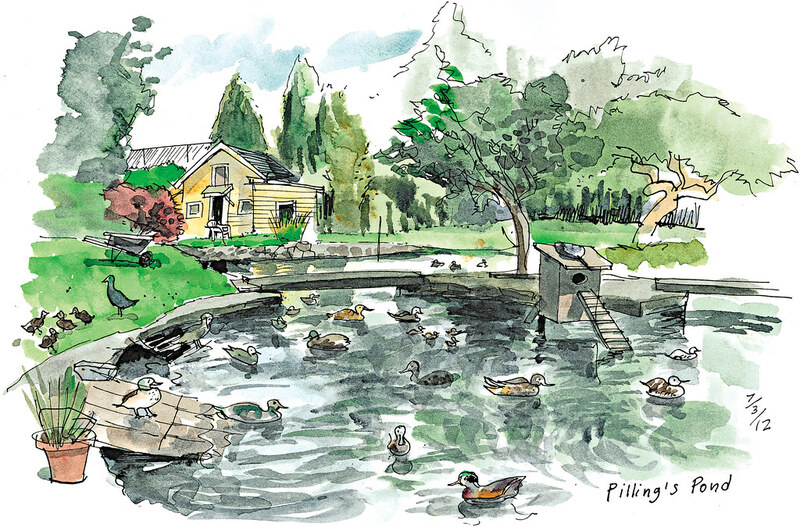 Over the years, Pilling built the pond into a a bird sanctuary for more than 30 species of ducks, including some that had never reproduced in captivity, such as Harlequins and Buffleheads. Kunkle and other neighbors have cared for the pond and ducks since Pilling died in 2001 at age 90. Mike Boon delivers donated lettuce from PCC four times a week. And Wanda Fullner put up a sign that explains the history of the pond.